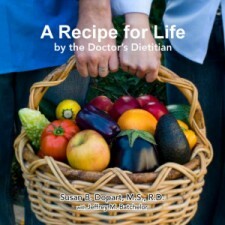 Susan Dopart's "A Recipe For Life"
I had just come home from doing a Big Shop at the grocery store one day several years ago. I set about putting away all those groceries, which took quite a while, and at last I had only one item left to put away. It was a very large plastic bottle of ketchup. We didn’t need the ketchup right away, so I decided to put it up on a top shelf. I use a wheelchair, and can’t stand up at all to reach high shelves, but I have reachers that help me access places that are too high. I placed the bottle in the rubber grips of the reacher, checked to make sure I had a firm grip on it, then lifted the reacher toward the shelf. No problem…so far so good…ketchup was safely placed on the shelf. EXCEPT that as I tried to bring the reacher back down, it caught the bottle again…and brought it down! The heavy plastic bottle fell and hit the edge of the countertop JUST RIGHT (or wrong!) and split open. KETCHUP EXPLODED ALL OVER THE KITCHEN–AND ME!! There was ketchup absolutely everywhere in the kitchen…the floor, the ceiling, the walls, the cupboards, the refrigerator, the dishes, the table, the dog food bowl…everywhere. And I was completely covered. It was all over my clothes and my wheelchair, my face was covered, my hair was streaked with tomatoey stickiness. I was stunned and just sat there for about a full minute as I surveyed the disaster. My moment of astonishment was interrupted by…THE DOORBELL!! Argh!!!! Believe it or not, a old friend that I hadn’t seen in about ten years had looked me up and found my address and had come to reconnect with me. And there I was, answering the door covered in ketchup and laughing. It was not my finest moment, but it was certainly a memorable one! What a huge mess! I’m glad I wasn’t the one cleaning that up. Next we have some honorable mentions. Everyone who is listed below will receive some sample packs of Kelapo coconut oil! My worst kitchen klutz would have to be: I was canning tomatoes a few summers ago and had all the quart jars filled with tomatoes and had them in the hot water bath canner and proceeded to process them. When it was time to take them out of the canner, I lifted the lid and instantly one of my jars blew to pieces. No only did it scare the jahebee out of me, but it also sent hot tomato pieces flying everywhere. They were on the ceiling, floor,stove,shelves, lights, cabinets, and everywhere else you could think of. I spent the next six hours cleaning up tomatoes. Luckily, I have not had that problem again!!! So — one morning I was making pancakes for my 3 boys. Did the usual, mixed flour, eggs, etc. Stirred, put on the griddle and served them up. Son # 3 is taking a big bite, and realizes there is something in the pancake. Lo and behold it’s a screw. Now where in the world did that come from? Begin checking my flour canister, nope, all’s fine. Maybe the sugar? Nope — nothing in there either. Could it have possibly been in the eggs? That would be amazing. Chalked it up to “who knows” and got him a new pancake. One bite, and this time he finds a nut. Not a walnut, but a nut that matches the screw he just found! After laughing hysterically, we played detective and finally figured it out. While mixing the batter, I had opened the cabinet above to get out a glass for the aforementioned son. The screw and nut had fallen right off the hinge of the door, and plopped into the batter where it sinked into oblivion — and I never even noticed! I did the approved mom action and said it was all his fault since he wanted a glass. I am a huge klutz (kitchen or otherwise)!! One morning I was making my usual cup of tea to take on my way to work. I had just poured the water into my travel mug turned around to get the milk and proceeded to knock my mug on the floor. The tea hit the floor and slashed up onto the back of my right calf. We’ve all scalded ourselves (right? or is that just klutz territory??) so I figured ‘no problem, slap some aloe on it and it’ll be fine’. That’s exactly what I did, changed my clothes, made another cup of tea and took off for work. A few hours later I could still feel the burning sensation on my leg and checked the burn area. Didn’t look good and just so happened that my boss walked in and saw the burn. Under threat of (more) bodily harm I went to a walk-in medical clinic that was close by. Guess what?? Third degree burns to the back of my calf!! I had to go to the clinic every day for them to change the dressing and within a week it was infected from just below my knee to just above my ankle!! Now we’re talking hospitals, intravenous meds (for 3 days), home care nurses (for 2 wks) it was awful. After the 2 weeks off I had to continue my daily visits to the clinic for dressing changes. This continued for 6 months!! When the doctor finally deemed that I didn’t have to have the dressings anymore he told me how bad the burn/infection actually had been. The infection had ‘almost’ reached the bone, if it had I could have possibly lost the leg. For the following 6 mths I had to keep the original burn site covered and always have sunblock on. What an ordeal just from being a ‘kitchen klutz’!! We were at our lake cabin which had an open kitchen/family room setup with smooth tile flooring throughout the whole area. My daughter had brought her fiancé “home” to meet us for the first time. He was sitting on the couch which faced the beautiful serene view of the lake while I proceeded to slice the roast with a fork and carving knife in the kitchen area. In a blink of an eye the roast flew off the counter, skidded across the floor and came to a rest at the feet of our soon-to-be son-in-law, who had not been warned of my “culinary skills”. While the rest of us hooted with laughter my shocked, soon-to-be son-in-law kept repeating, “A little dirt never hurt anyone.” Poor guy! I think your prize pack is pretty much klutz free, just don’t drop your jar of coconut oil. Coconut oil would not be fun to clean up! My address is: 310 South Turner, Sioux City, Iowa 51103. I put my address in two other comment places on your websites because I didn’t notice this one first! Thank you!